Single piece pickle display for mounting on cooler doors. Freestone Pickle is a Michigan pickle company that’s been in business for over 100 years. The pickles are individually packaged and sold in the cold storage aisles of grocery and convenience stores. To sell pickles, people need to see pickles. 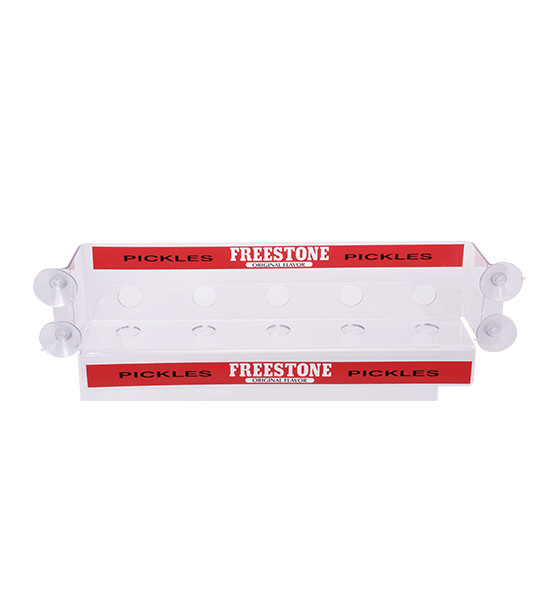 We designed a single piece pickle display with four suction cups that mounted directly on the back of the cooler doors. We added brand labels at the top and bottom of the display so that retailers could not fill our displays with inferior pickles - which would be bad form. This display put Freestone Pickles literally front and center in the cut-throat competitive individual cooler pickle market. Pickle profits peaked profoundly.